“That the National General Assembly supports the Welcoming Cities initiative launched by the Scanlon Foundation and Welcome to Australia in March 2016; and the development of The Australian Standard for Welcoming Cities, to support local councils in their work to create more inclusive communities” – Resolution carried at the Australian Local Government National General Assembly (City of Whittlesea’s Motion 39), June 2017. The Australian local government sector has great potential to contribute enormously to better migrant and refugee settlement, provide leadership in addressing community relations issues arising from cultural diversity, and facilitate social inclusion and cohesion in local communities. Many local councils already excel in this endeavour while others are developing their capacity. The challenge is: how do 537 municipal authorities across the country develop a reasonably consistent and planned “sectoral” response to this role; and how do State and Federal Governments work across the local tier of government to support and foster this? And further, how do community sector peak bodies engage a disparate local government sector? The national peak body for local government is the Australian Local Government Association. The ALGA is the national voice of local government, representing 537 councils across the country. In structure, ALGA is a federation of state and territory local government associations. The ALGA’s peak forum is the annual National General Assembly (NGA) which was most recently held in Canberra 18-21 June, 2017. The theme of the 2017 NGA, Building Tomorrow’s Communities, goes to the heart of the role of local government in modern Australia. It addressed how councils, often working in partnership with other levels of government, or the private and not-for-profit sectors, are shaping the future and responding appropriately to challenges that lie ahead. Each State has a local government peak association which, for example in Victoria, is the Municipal Association of Victoria. However the focus of State and national peak bodies is largely advocacy, development and support; individual councils remain more or less independent entities with regard to their own policy, program design and service delivery. Settlement services for migrants and refugees has historically been resourced and led by the Australian Government since the creation of the Immigration Department in 1945. Following the 2013 change of government, changes in the “machinery of government” moved this responsibility from the Immigration portfolio primarily to the then newly created Department of Social Services, with a couple of notable exceptions. The Adult Migrant Education Program, which teaches English language to new arrivals, is now administered by the federal Department of Education and Training. The Department of Immigration and Border Protection (DIBP) retains carriage of TIS National, the Translating and Interpreting Service. DIBP also continues to administer Australian Citizenship, conferral of which primarily occurs through delegation to local councils. Until recent years, settlement planning and multicultural community relations strategies were managed top-down largely through the leadership of the federal Immigration portfolio. In recent years the Commonwealth has stepped back from this intergovernmental cross-portfolio leadership role which has largely defaulted to State Governments. However, what happens at the municipal level is what really counts; that is where new arrivals are; where people and the community are. What is currently missing in Australia is an agreed and effective inter-governmental strategy that effectively harnesses the potential of local government to more systemically make a nationally consistent and planned sectoral contribution. Local councils are being increasingly called on to provide inter-agency leadership in local planning and co-ordination for the settlement of newly arriving migrants and refugees. While this has traditionally been a federal government responsibility, systemic inter-governmental engagement in this area has waned over the past decade putting a greater onus on councils to provide even greater leadership at the local level. In meeting this challenge local government, as a national sector, is necessarily disparate in its approaches. Victoria, for example, has 79 municipal authorities; nationally there are 537. There is no national legislative overlay underpinning local government multicultural policy. In fact, local government is yet to be recognised in the Australian Constitution. Sectoral policy development sits largely with under-resourced State and Territory local government peak associations, and at the national level with the ALGA. For local government to respond consistently at the national level to issues arising from cultural diversity requires a much better resourced, systemic, and coordinated partnership with State and Federal governments. It also requires more than a broad-brush “national framework” that sets out inter-governmental demarcations. For what is a core public policy priority and a central pillar of our nation-building, Australia needs a clearly articulated, and mutually agreed national strategy underpinning the agreed respective roles and responsibilities of the three levels of government around settlement planning and cultural diversity policy and practice. Putting aside the particular sectoral challenges facing local government nationally and at the State level, many individual councils have well-developed approaches to addressing issues arising from cultural diversity at the municipal level. The relatively recent and historical shift away from the Federal government driving settlement planning and related community relations strategies needs to be made more overt, transparent and underpinned by a planning process and negotiated intergovernmental agreements. This includes resourcing agreements that address local government’s concerns around perceived cost-shifting. Despite the good work of municipal authorities around Australia, only greater support and engagement from federal and state governments will aid development of more consistent, systemic Australia-wide local government sectoral momentum. In particular, the federal government needs to provide more effective sectoral support for the role local government already does and can potentially play in addressing settlement, multicultural affairs and community relations issues arising from cultural, religious and linguistic diversity. A clearer, agreed, and more systemic framework for addressing migrant and humanitarian settlement and broader community relations issues would be helpful to all three spheres of government and enhance prospects for a more collegiate collective approach by the government sector across all three of its tiers. There does exist a relatively recently agreed National Settlement Framework. It is a high level structural blueprint for Commonwealth, State and Territory and Local Government, to work in partnership to effectively plan and deliver services that support the settlement of migrants and new arrivals in Australia. The Framework sets out focus areas for the three tiers of government to regularly engage and work together in partnership on, and to collaborate with stakeholders. However it requires a much higher level of collective commitment to make a difference to the settlement experience of new arrivals and their wider communities in municipalities. Australian society is culturally diverse. Our multicultural public policy response needs to be, and be seen to be, owned by and for all Australians, not just those communities commonly referred to as culturally and linguistically diverse. Nor should debate be driven only by opinion leaders in the media who more often than not are pushing particular ideological agendas. We need to find ways to move away from a perception that multiculturalism is primarily a matter of interest for community groups with a more recent history of migration or individuals with a media profile. A genuine sense of collective community ownership, valuing and perceived benefit from cultural diversity by all Australians is the best way to nurture this part of our collective heritage and future. What happens at the local level with the leadership of councils is pivotal to how this plays out in local communities. Australian national identity and values are not static entities; they are evolving. Neither can they be set and determined exclusively by political edicts. In addition to an ancient Indigenous culture and a colonial history, Australia has a young and evolving national and cultural identity. Over the past few decades our demographic reality and multicultural public policy arising to address it, have dramatically changed the way Australians of all backgrounds see and think of themselves. Our culturally and linguistically diverse communities all contribute to this evolving national identity and landscape and they collectively express themselves within this shared view of ourselves as a diverse society with diverse communities. Regardless of our different heritages, Australians, of whatever background, increasingly see themselves collectively within a broader shared multicultural identity. Local government recognises that it has a responsibility to address issues arising from cultural diversity and seeks to work collaboratively with the other two levels of government, the business and community sectors and other stakeholders to achieve optimal outcomes for the whole community. The 2017 local government National General Assembly was themed “Building Tomorrow’s Communities”. Multicultural public policy addressing cultural diversity needs to be a central tenant of this agenda. Welcoming Cities is an initiative of the Scanlon Foundation and Welcome to Australia in partnership with Welcoming America. The initiative offers local councils and local community leaders the opportunity to leverage ideas and innovation that come from being welcoming and inclusive through a national support network. Support for the Welcoming Cities initiative at the 2017 National General Assembly is an encouraging step towards a more consistent national local government approach to addressing the range of issues and challenges arising from cultural diversity. Beyond that, a federally convened national forum to facilitate consolidating and progressing local government multicultural policy development is what Australia needs and has yet to have. Image: Andrew Hill. 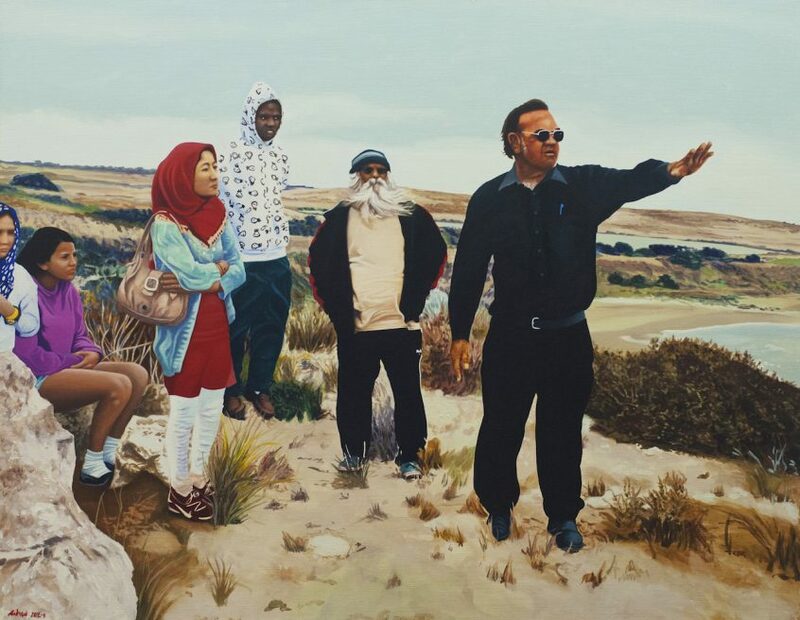 Uncle Tom Trevorrow, accompanied by Major Sumner, introduces new arrivals to the lands of the Ngarrindjeri nations, 2012. Image and name of Uncle Tom used with the permission of his family.